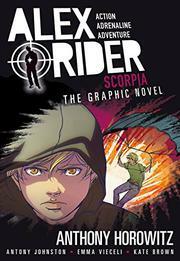 In this graphic-novel adaptation of the popular series, teenage spy Alex Rider must infiltrate a ruthless gang of assassins in possession of a terrifying deadly weapon. On a school trip to Venice, the 14-year-old, white sometimes-spy for MI6 begins investigating Scorpia, a syndicate of murderers for hire rumored to have ties to his deceased father. When Scorpia discovers Alex’s lineage, spy training, and ties to British intelligence, they manipulate him into joining their ranks. As he tries to figure out where his loyalties should lie, Alex learns that Scorpia is threatening to release a weapon that could slay thousands of innocent British schoolchildren; can he stop them before it’s too late? With pulse-pounding plotting, a cinematic scope, and a nail-biting cliffhanger, this clever spinoff makes for an entertaining accompaniment to the prose series. Unlike previous installments, this volume shrugs off the nifty gadgets and episodic feel for a more brooding exploration of the intelligence world. Longtime fans may notice a subtle artistic shift to a more Western-style look to the characters as new illustrators Viecili and Brown replace the previous artists’ decidedly manga-inspired approach. Though the other volumes in this series can stand alone, this one and its dovetailing predecessor, Eagle Strike, illustrated by Kanako and Yuzuru, will be simultaneously released.